don’t get this myth of james’ “bad attitude”. he has been nothing but respectful and a hard worker since he got here. this myth was started by german media, who is biased in favor of müller. It's just being himself. He can't help himself and he'll whine, scream or get angry not because of the club but because of himself. That's just James. German media didn't start anything. Long before he arrived to Bayern he was marked like this. I don't he is that bad as media said or say he is, but without that he could give much more than last and this season with an important note that this season it's not his fault for not being played, but that goes on Kovač's soul. Media may have been biased and pushed Müller for the whole 2018, wrote extremely stupid pro-Müller articles when in the meantime his performances and form were constantly horrible and not nearly to his 2009-2016 period, but that writing and all those opinions have nothing to do with Bayern and the coach's judgement since the media neither select nor decide the starting line-up at Bayern or somethin' else. Germans want James Rodríguez every single match in the first 11, not Müller. The same I want to see since he arrived to Bayern in 2017. I don't care what other people say or think, but he must be bought in May and play for us in the next 4 years. I can't and I won't say that for the coach after this season no matter what happens this season. Umm? Ribery gave Robben a black eye and I dont see you mentioning him up there as a troubled player. Robben is the DEFINITION of a consummate football professional, everybody (present and former) involved in & around up until this point are saying that. In 20 years time, people will be taking about how soft players of their era are and people will remember 'the good old 2010s'. And someone will post this photo and say it would never happen in 2039. You think punching your teammate is a good thing? 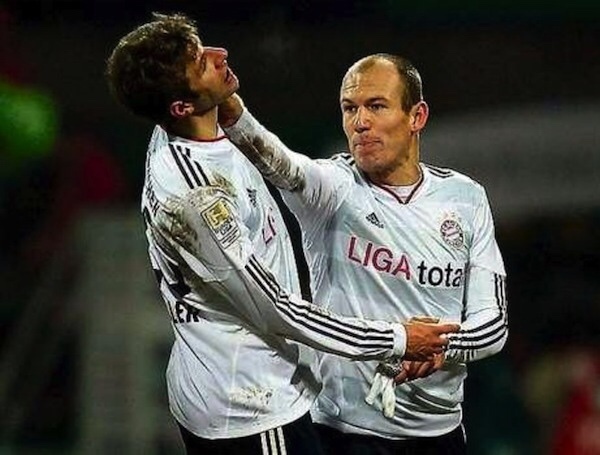 bastos80 wrote: You think punching your teammate is a good thing? Absolutely not. What I meant was that people should have realised that what had happened was really bad and there should have been more severe repurcussions. Thankfully, Robben has not continued on such a path. Can't say the same about Franck though. IMO, He was pathetic today against Liverpool. America USA wrote: IMO, He was pathetic today against Liverpool.